This page should answer any questions you may have regarding our Sale. Please email us if there are any other questions. All horses presented for the sale are considered of fine temperament, sound way of going, and good conformation before being entered into sale. Four radiographic views are taken of each hock and a single view of the front feet are taken on all entries. A Coggin�s test is also done. If for any reason it appears something should be noted, additional x-rays may be taken to ensure nothing visible is overlooked. All horses are in a working program for the days in May before the sale date. If any soundness issues arise during this time, the horse is re-examined and may be pulled from the sale with a veterinary certificate. All horses are handled, bathed, clipped and fully groomed each day as well as checked for lumps, bumps, or sores which may have incurred due to training. Eight days prior to sale date, the stable is open for potential buyers to try horses of their choice and to arrange for private vettings if so desired. As each horse is sold on the day of sale, any notable information is disclosed. Although precautions are taken to ensure each horse is right of �wind and limb�, it is advisable to have a vet of your choice look at the horse or horses you have decided on. Our 2018 Auction Sale will be held on Saturday May 26th at 12:00pm. Horses may be previewed by appointment only between May 20th and 23rd, 2018. See the viewing and trial period schedule here. The location of this sale will be Orchard Park Stables, Freelton Ontario. The 2018 schedule! Please note that we will be opening Orchard Park Stables for previewing and trying horses between May 20th and 23rd. All free jumping videos will be available to be seen on any of the other preview days as well as at the sale. Please make an appointment. If you do wish to register in advance, please print out the registration form and return it to the Registration Officer. All details are on the document. Please read the Terms & Conditions below for payment information. We do not employ sales agents, nor do we pay commissions to buyers' representatives. To avoid the possibility of conflicts of interest, any compensation to a third party acting for a purchaser is a private matter between that party and the purchaser. All entries are sold �as is�. All sales are final. Absolutely No guarantee after you leave the sale arena. All papers pertaining to the soundness of any horse its pedigree and any breeding information on file, are available for inspection by registered bidders upon request. Prior to the auction a veterinarian has examined all horses, and all horses have been x-rayed. All horses have up to date coggins tests. Any further information regarding the health of the horse may be obtained on site. A veterinarian can be available upon request at prospective buyer�s expense. Please contact us prior to sale. All reasonable offers accepted. Highest bidder shall be the buyer. Should a dispute arise the Auctioneer�s decision shall be final. Bids received after the fall of the hammer are not valid nor are they grounds for dispute. Bids acknowledged by bid spotters employed by the Auctioneer are recognized as if tendered to the Auctioneer, but in case of dispute the bidding shall be reopened immediately for advanced bids and if there are no advanced bids, the horse will be sold to the person from whom the Auctioneer recognized the last bid. In case of dispute, advanced bidding shall be restricted to the contending parties, but should the recognized bid be reduced below the bid at commencement of the dispute, then bidding shall be reopened to all bidders. Any agents planning on bidding for a client must notify the sales management prior to the beginning of the sale, and they must register for themselves and their client with method of payment approved before the commencement of the sale . Absentee bids are permitted and accepted prior to the sale in writing, by fax, or during the auction by phone. In either case the bidder must have payment method approved prior to sale. Please note that the sales management nor Auctioneer accept any responsibility for transactions between agent and client. The purchaser, at the fall of the hammer, assumes all risk and responsibility for the horse, but the animal shall not be released to the buyer until satisfactory settlement has been made in Canadian dollars, to the sale cashier. Delivery will be made in the form of a Stable release for the horse, provided the purchaser has made full payment. Horses that remain on the property will be charged a board fee per day per horse. During the stay of the horse neither the sale management or Orchard Park Stables nor the Auctioneer or any of their agents shall be liable for any accidents, theft, disease, or sickness, death or injury, or damage to any horse however caused. Buyer must make settlement with the sale cashier. Payment may be made by: Cash or Certified Cheque, a 3% administration fee will be added. We will not be excepting credit cards or debit this year, however for all customers in good standing, personal cheques will be accepted. Wire or E-transfers can also be arranged. Purchaser shall make arrangement for payment in Canadian dollars plus applicable sales taxes. Exchange will be given and posted on U.S. funds at the current bank rate at sale time. Purchasers who fail in any respect to pay for horses as provided for under the conditions of sale may be declared in default. In such case, the sale management may declare the sale void or any horse purchased by a defaulter may be resold at public or private sale without notice for defaulter�s account, reasonable costs of such resale, including transportation and all other out of pocket expense to be borne by defaulter. Should such resale fail to satisfy the defaulter�s account in full, defaulter shall pay the sales management the amount owing and interest at 24% per annum on the unpaid balance as set forth in conditions, failing which the sales management may bring suit against the defaulter. Defaulter shall pay all reasonable legal fees and cost of such litigation. Buyer and spectators are absolutely at their own risk. Ontario Breeders Production sale, Orchard Park Stables, Jim McCartney Auction Ltd. disclaim any liability for the two days of the sale. The public is cautioned to be extremely careful while on the grounds, examining horses and particularly while horses are being shown and ridden. Do not enter stalls under any conditions. The sales management, its auction service and Orchard Park Stables reserve the right to take whatever action required to protect the health and welfare of any horse at the expense of the owner in an emergency. X-rays and up to date coggins are available. Any further information regarding the health of the horse may be obtained on site. A veterinarian can be available upon request. Please contact us prior to the Sale. 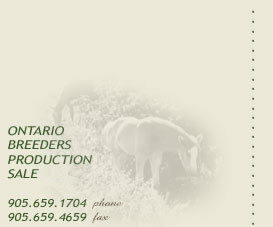 X-rays will remain the property of Ontario Breeders Production Sale. Coggins tests will be released with the horse to the buyer.